The Uprising is over, and powerful mercenary captains dominate whole planets as Warlords, taking to orbit in makeshift or stolen Warbarges, waging perpetual war in Molden Heath. You are one of these Warlords, or aspire to become one. So, let’s get going and review the contents of this promising release. We have also included patch notes at the bottom to prep you for everything headed your way on April 28th. 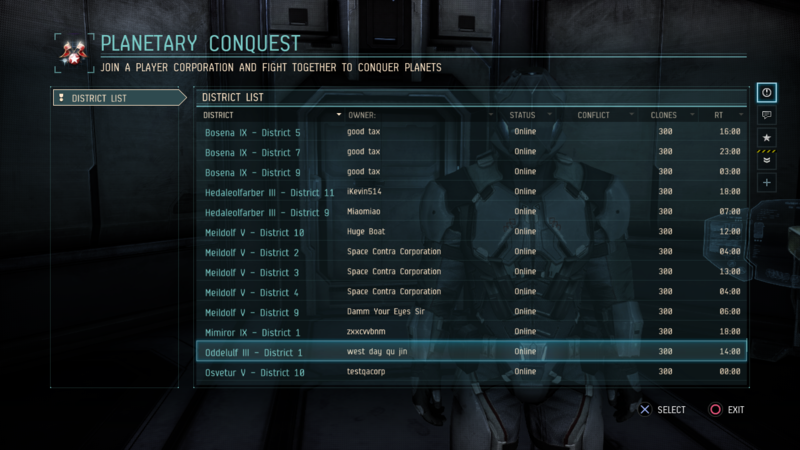 Yes, we finally have Player Trading, read all about it in CCP Rattati’s Player Trading dev blog. The “Show Info” menu on a Loadout now displays all gear on it. Some of our favorite parts are the Size categories for Saved Loadouts and new Dropsuit contextual categories when creating a new loadout. We also added contextual gear categories to the fitting screen, with items sorted by Meta level, while also showing a dynamic Meta level Sum of your loadout. This makes it more rewarding and clearer to you that when you unlock a skill and replace gear with more powerful gear, you are making progress. To that end, we also display the Meta level of all your Saved Loadouts, it’s rewarding to see your latest Loadout compared to the Starter Loadouts. We also added multiple smaller tweaks, such as the UI remembering where you were in the Assets when swapping to Marketplace, and also allowing you to move up and down in your inventory with the same settings, making comparison much easier and the UI simpler to use The default view now changes when changing gear in slots to a “before and after view”, showing changes in green and red colors. An internal favorite is a new popup window whenever claiming items from the Experimental Laboratory and Strongboxes. We have also added a little bonus UX, you can now open 10 boxes at the same time and get one guaranteed rare item. Of course, Matchmaking is a key user experience, and details on two layer system are in ourNew Matchmaking Engine blog. 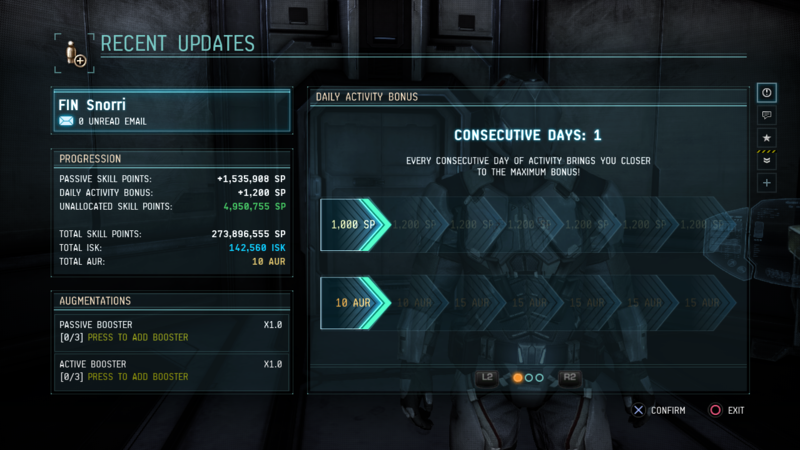 We have also decided to reward loyal players by adding an AUR daily reward to the Welcome Screen. This will allow players to earn AUR and save up for one of our AUR offerings. This feature will roll out two weeks after the deployment of Warlords 1.1 due to server changes we have to perform in order for this to be fully functional. The final User experience improvement is aimed for both new and veteran players, a new UI for Planetary Conquest. This page may pique the interest of the new players, and is a better overview for those already active in Planetary Conquest. This is the first step of many to come to make Planetary Conquest the endgame to strive for. Additionally, your upcoming PC battles will be sorted at the top and as a corporation leader, you can find juicy targets, such as low clone Districts or suitable Timers much easier than before. Visually customizing your dropsuit is now as easy as changing a single module. A SKIN module slot has been added to the layout of every dropsuit. That slot can be fitted with a SKIN (Super Kerr-Induced Nanocoating) module, from a contextual menu. 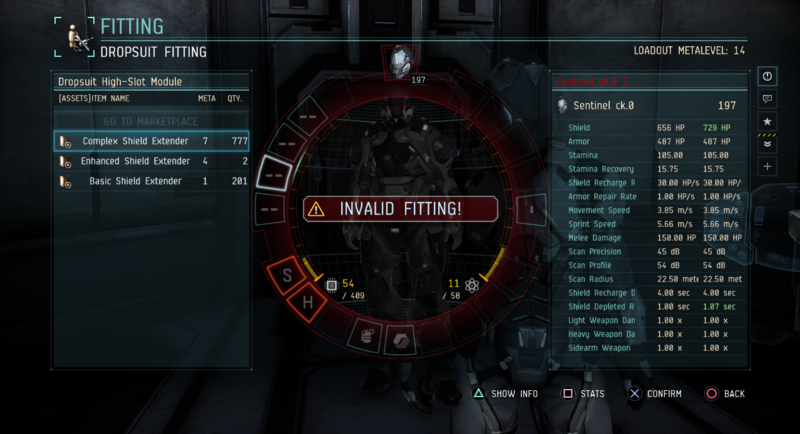 This in turn means that you will be able to customize your prototype suits for the first time. As a rule of thumb, purchased SKINs will be BPO’s so you will never run out and be able to use them on multiple fits. 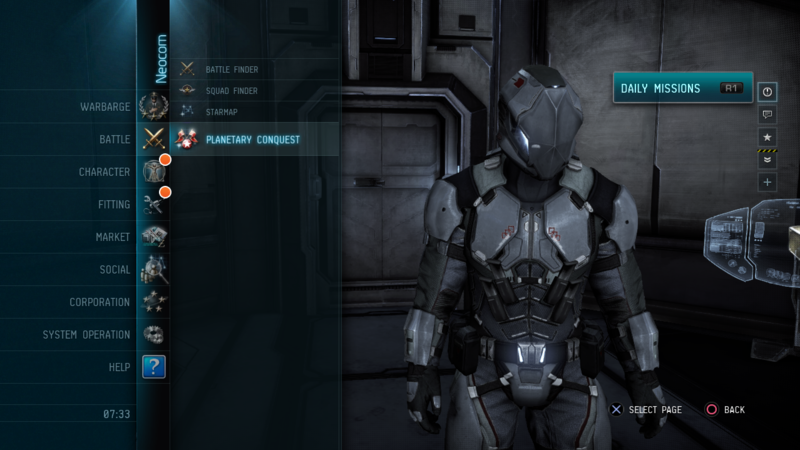 Just to be clear, each SKIN will work on a single combination of Faction and Size, for example: a Medium Minmatar Dropsuit (Basic, Assault and Logistics), a Heavy Amarr Dropsuit (Basic, Commando and Sentinel), and a Light Caldari Dropsuit (Basic and Scout), for all Sizes and Factions. We will add to the selection of SKINs over time, whether purchased for ISK, AUR or Loyalty Points, while also having skill requirements. In the near future, we plan on slowly replacing all visually different Dropsuit BPO’s with a regular STD BPO of the same Faction and Size and a SKIN BPO through scripts. 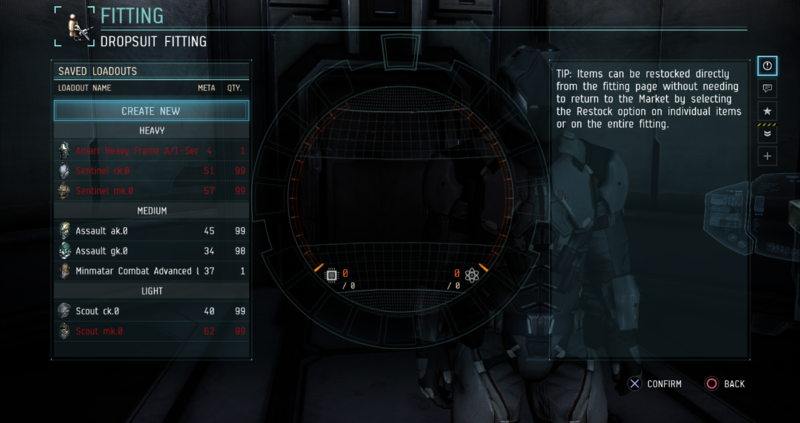 This will reduce the player inventory of dropsuits quite a bit and make visual customization even simpler. Your team needs to establish electronic control over the combat space in order to secure it as a forward military position. 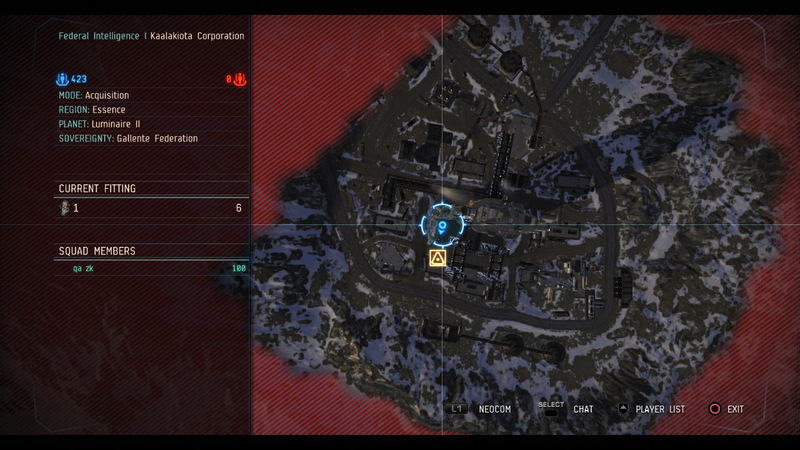 This is done by hacking and securing key locations within the designated combat space. New site is online. Capture and defend it to start acquiring PtU for 5 minutes. 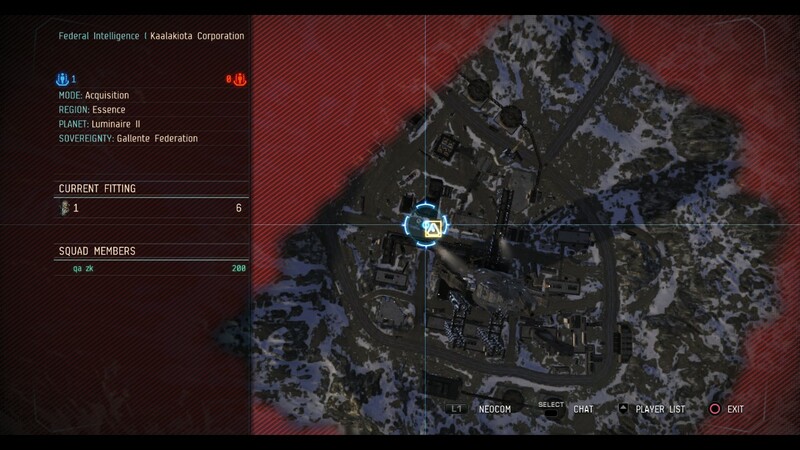 There are multiple sites scattered across the map, all Offline except one Inactive. When that site is hacked by a team, a countdown timer starts and the team holding the site gains Pt units (PtU – units that represent how much of the network your team controls) at a set rate for 5 minutes. The collection rate is doubled in the last minute of the countdown so it is imperative to hold it for the whole duration. Immediately when that countdown finishes, another random site becomes Inactive and can be hacked. Site hacked, PtU acquisition will last for 5 minutes. Defend it! This Game Mode has multiple emergent gameplay moments and strategies, do you scatter scouts around the map and gamble on getting the final three sites, breach every site with overwhelming firepower, only depending on the final minute, or set up a highly mobile force that can rapidly redeploy to the next site. The choice is yours. Time ran out, new site is now available. 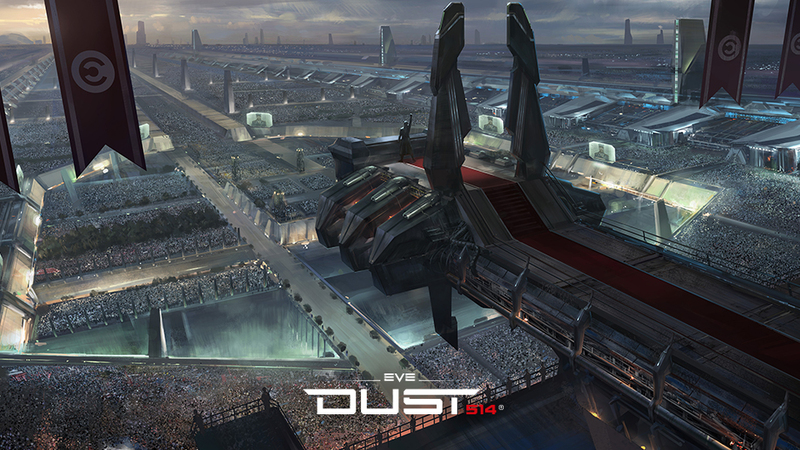 That’s it for now, and we hope you enjoy the improved DUST 514 experience! * An amount of AUR will now be granted as a reward for logging in, increasing with consecutive logins. * Dropsuit SKIN modules have been added to the Marketplace, which override the color scheme on applicable dropsuits. * A new Game Mode has been added: Acquisition, where mercenaries fight to claim the battlefield from randomly moving terminals before the time runs out. * A new page has been added to the Neocom: Planetary Conquest, where all players can see the current information of all the Districts in one overview, i.e. Clones, Reinforcement Timers, State and more, and CEOs can launch Attacks. * Miniature Jump Portals have been placed into a few Academy Maps to shorten the distance to strategic objectives quicker and easier for new players. 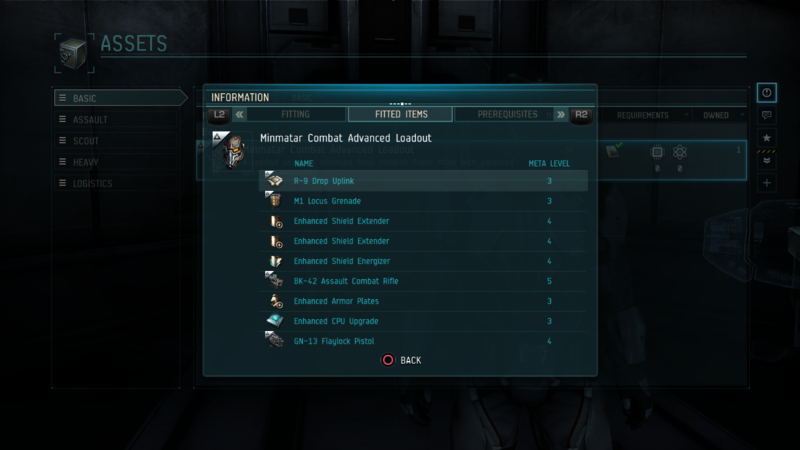 * "Show Info" on a Loadout now shows all items fitted on it, in the Marketplace, Assets and where applicable. * "Show Info" on a Skill now shows all items that are unlocked by the Skill and at what level they are unlocked. * Creating a Loadout has been streamlined using Categories. - When creating a Loadout, available dropsuits will be displayed by Marketplace Category (Frame Size); Light, Medium and Heavy, and sorted by Meta level. 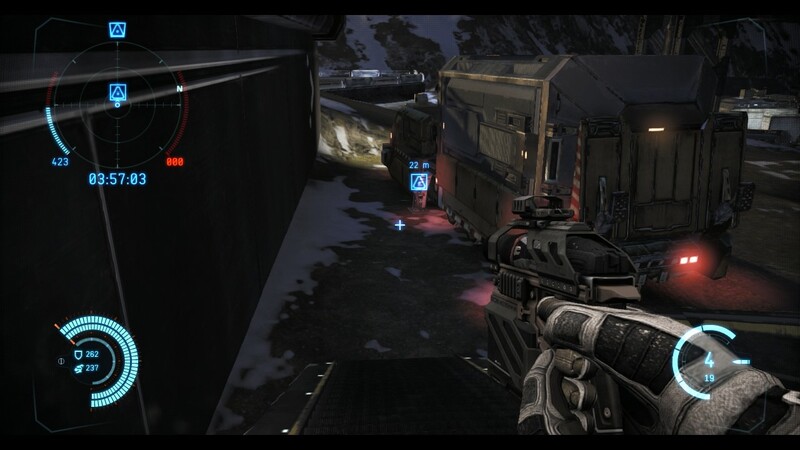 - When creating a Loadout, the information about each Dropsuit is displayed on the right hand information bar. - When fitting an item into a slot, available items will be displayed by Marketplace Category, such as Armor Plate, Shield Extender and more, sorted by Meta level. 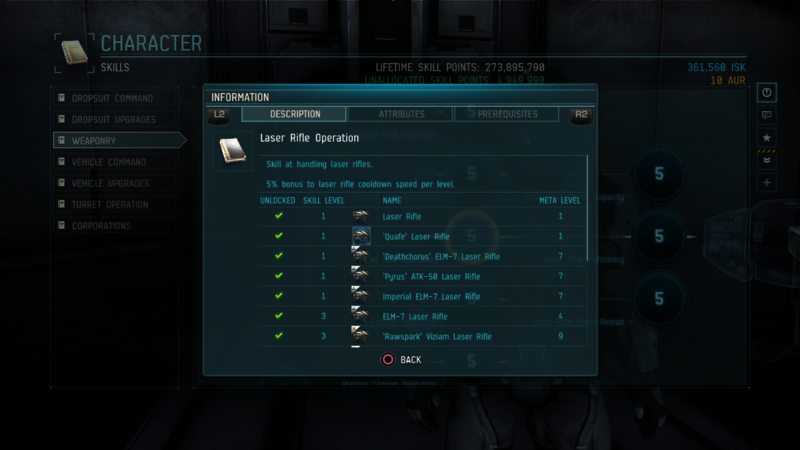 * Loadout Meta level, as in, the sum of all item's Meta level, is displayed in the list of Saved Loadouts. 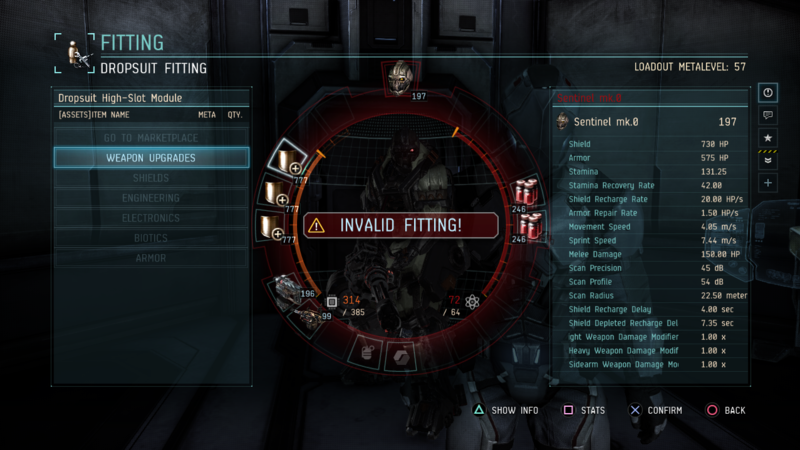 * Loadout Meta level will be displayed prominently while adding or replacing items in the Fitting Screen. * Saved Fittings have been renamed to Saved Loadouts. * Saved Loadouts are now sorted by Frame Size. * When claiming items from the Experimental Laboratory and Strongboxes, the full list of claimed items is displayed in a popup message. * ISK items can now be sent to other players via the Contacts screen. * To improve performance Character Avatar thumbnails will be removed from the client in certain locations. * A new Matchmaking algorithm has been enabled. * Planetary Conquest End of Match rewards will be changed to a new rule, Team A recovers Team B's losses, split equally among team A's members, and vice versa. Biomass will no longer be awarded as a reward for winning, successfully defending or claiming a District is reward enough. * To improve performance any emails will be kept for 30 days and deleted. * New Characters will be graduated from the Academy based on User Lifetime Statistics, not the Character statistics. * Character Avatars thumbnails have been removed from the Contacts page.